This article was written for NorthPoleHoops.com, but the concepts, drills, and exercises displayed here are beneficial for athletes of all sports, and anyone in general! “The fundamental principle of animal motion is that all activity is the result of balance between stability and mobility in the body” (Siff, 2004). In my previous Rise & Grind article, ‘Training the Engine Part 1’, I discussed the role of hip mobility in your ability to produce optimal on-court performance, while keeping you healthy in the process. Once sufficient mobility has been attained, it is important to control this mobility by developing stability at the hips. As discussed in the previous article, the ‘Joint-by-Joint Approach’ tells us that each joint in the body is meant for either mobility or stability (Cook, 2010). In the case of the hips, a combination of both mobility and stability is required to keep the ankles, knees, and lower back healthy, as well as to maximize power output. This article is meant to provide you with further strategies to create a solid foundation of movement at the hips, which will allow you to safely train for high levels of strength, speed, and vertical jump. Having the ability to accelerate quickly, and be a high flyer means being able to instantaneously produce high levels of muscular tension when required (Cook, 2010). When your balance, stability, and motor control are limited, the ability to reach your genetic potential in terms of muscle tension can be hindered. On top of this, with a lack of stability the hips, your joints may become misaligned, causing energy leaks which will reduce the level of ground reaction forces you are capable of producing. 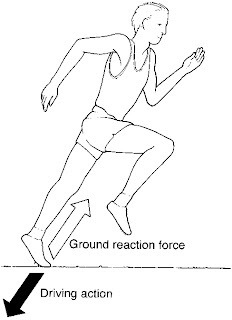 Ground reaction forces are responsible for how high you jump, how fast you sprint, and how quickly you change direction. level of hip mobility has been attained, it is necessary to then stabilize your hips through a combination of both isolated and integrated stability training. Prior to beginning training, you should know how much mobility, and how much stability you will need to develop. This can sometimes be a tricky process, due to the fact that if there is a lack of stability, your muscles will develop an undesired level of stiffness and tension to create a level of fake stability, which to many will appear as a mobility issue (Cook, 2010). It is important to consult with a qualified professional to determine if the stiffness you are experiencing is due to a lack of mobility, or a lack of stability. Stabilizers should be trained to produce joint integrity, alignment, and control in both isolated and integrated situations. While it may be tempting for athletes to immediately lift very heavy loads and perform intense plyometrics, in many cases it is necessary to take some time to develop the mobility and stability required to do the fun stuff properly. Baron Davis knows all about energy leaks! Isolated hip stability exercises will involve stability at one body segment, with movement occurring at another segment. Isolated stability exercises will generally take place in all of the postures between laying down on your stomach/back, and standing upright. Depending on your ability levels, it may be necessary to first focus on a series of isolated hip stability exercises before advancing to integrated stability exercises. It other cases, it may be acceptable and beneficial to perform isolated and integrated stability exercises concurrently. In the video below are some examples of isolated stability exercises that anyone could benefit from. Integrated hip stability exercises will require stabilizing a joint in one or more planes of motion, with primary movement taking place in a different plane of motion. Integrated stability exercises can also be viewed as movement pattern retraining with reinforcement of the coordination and timing between the body’s segments which is necessary to complete the specific movements required on the basketball court with the highest level of efficiency. Movement pattern re-training can involve exercises with a symmetrical, asymmetrical (i.e lunging), and single leg stance. Athletes should be competent with these movements prior to advancing to lifting heavy weights with a goal of becoming bigger, faster, and stronger. In the video below are some examples of integrated stability exercises that anyone could benefit from. If you have any questions about how to integrate these exercises into your routine, or to find out what exercises would be ideal for your specific needs, please e-mail me at Sean@NorthPoleHoops.com. Siff, M. (2004) Super Training. Super Training Institute. Denver, CO.
Cook, G. (2010) Movement. On Target Publications. On Target Publications. Santa Cruz, CA. I wrote the following article for North Pole Hoops, but the drills and exercises here can be applied to any sport, or anyone in general! The hips are your body’s engine. One of the first changes my basketball players report to me, within a week of beginning training, is how great their hips feel when moving on the court. Performance training is more than just how heavy, and how fast you can move a weight. Performance training is also about allowing your joints to move, unrestricted, in a full range of motion, paired with stability. A combination of pre-requisite mobility, and a high level of stability will allow your body to move the way it was intended, while also significantly reducing your risk for injury. In this first of two articles on the hips, I am going to focus on hip mobility, with the goal of giving you strategies and drills that you can use to improve the function of your hips. You never know when you may need a little extra hip mobility! A study (Iashvili, 1982) concluded that “the level of joint mobility generally relates strongly to sporting proficiency. The higher the level of sporting proficiency, the greater the passive and active flexibility”. A lack of mobility at the hips will cause a change in optimal function at the hips, putting the muscle-tendon system, and overall joint structure at an increase risk of injury. A concept known as the ‘Joint-by-Joint Approach’, tells us that some joints in the body are meant for stability, and some are meant for mobility (Cook, 2010). The hips are built to be both mobile, and stable, and a lack of freedom of movement at the hips will cause the knees, and lower back (joints meant for stability) to compensate. Since the body works as an integrated kinetic chain, with no postural defects ever being truly isolated, a lack of mobility in the hips can also lead to structural issues all the way down to the feet and ankles. This unnecessary stress contributes heavily to the high incidence of knee, lower back, and ankle injuries in basketball players. Without the ability of your hip to move with the range of motion required in basketball, the muscles at the hip joint will be unable to generate their full potential of power in actions such as sprinting, sliding, and jumping. For example, if the hip flexors and hip adductors (inner thigh) are tight, your glutes (hip extensors & abductors) will be unable to fully extend and abduct, thus decreasing overall effectiveness, and movement efficiency. When correcting postural issues at the hips, it is important to strike an effective balance between mobility and stability by following a proper sequence of developing mobility before stability, and developing passive before active mobility, along with isolated before integrated stability. It is important to first have the pre-requisite mobility in your hips prior to developing stability. While stability at the hips can positively affect your ability to develop sufficient mobility, to develop stability prior to mobility, would be like allowing concrete to set in the wrong mould. To develop the necessary mobility for sport performance, you must ensure you develop sufficient joint range of motion, tissue length, and muscle flexibility (Cook, 2010). These qualities can be developed by focusing on both an athlete’s passive flexibility, and active mobility. Passive flexibility exercises will primarily improve the tissue length of the muscle complex itself. For athletes, active mobility is much more important for sports performance, however sufficient passive flexibility is necessary to provide a ‘buffer zone’ in the event that a joint is unexpectedly pushed beyond its’ normal range of motion as is required in the sport (Siff, 2004). A lack of passive flexibility can also lead to longer recovery times due to decreased circulation of fluids (Ylinen, 2008). Passive flexibility is typically improved via a slow and constant stretch, which does not require the athlete to use the muscles surrounding the joint to move to achieve the desired stretch. Self-Myofascial Release (via foam rolling etc) may also be needed to help reduce unnecessary tension in the muscle. Developing an athletes’ passive flexibility is necessary when the athlete’s joint range of motion is restricted by the muscle complex itself (Siff, 2004). Here are a few examples of exercises that can be used to develop an athletes’ passive flexibility in the hips. In order to transfer your passive flexibility to movements required in sport, it is important for the athlete to work on their ability to actively move their joints through a full range of motion through use of the muscles surrounding the joint, rather than having an object/person holding the joint in place for them (Tsatsouline, 2001). It doesn’t matter how much passive flexibility you have, if you are too weak to actively move your joint through a full range of motion. Active mobility drills may take place in a supine, half kneeling, quadruped, or standing position. If performed in a standing position, active mobility drills also have the capability of being great for fundamental movement pattern development, by simultaneously training the mobility, stability, coordination, and timing necessary for athletic movements seen on the basketball court. Here are a few examples of exercises that can be used to develop an athletes’ active mobility in the hips. Try to avoid passive flexibility work prior to a practice or game, as it has become common knowledge that static stretching can be detrimental to an athletes’ power output. However, if an athlete is extremely inflexible, to the point that it impairs their fundamental movement patterns, then in order to help prevent injury, the athlete will be better off performing passive flexibility work. 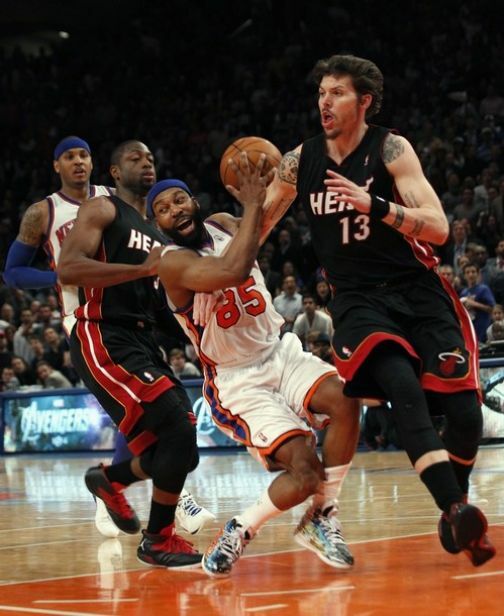 Active mobility drills, such as the examples provided above, should be used prior to the athlete stepping foot on the court. Once these have been performed, it will be important for the athlete to begin movement’s specific to what they will see in a basketball game. The best way to do this is to simply have the athlete go through a series of movements that would actually occur in a game (lay-up line, defensive slides/cuts, ball handling), beginning with slow movements, and progressing to game speed by the end of the warm up. When going through the sport specific movements, be sure that your players are focusing on their range of motion and muscles they are using (Siff, 2004). Tsatsouline, P. (2001) Relax Into Stretch. Advanced Fitness Solutions. St. Paul, MN. In Fall 2010, I had the great opportunity to sit down with then Toronto Raptors strength & conditioning coach, Francesco Cuzzolin, for a couple of hours, and pick his brain about what it was like to work as a strength coach for a professional sports team, and some of the methods he uses while working with elite basketball players. After recently speaking with a parent of an elite youth player, I recalled Francesco mentioning that it will typically take 4 off-seasons of hard work to develop a complete athlete, and thus why it is so important for young players to start learning how to train properly at a young age...so that they aren't spending their early college/professional years stuck on the bench, unable to handle the rigours of elite competition because of their limited strength and/or overall athleticism. In a properly designed long-term training scheme, the first off-season should typically be reserved for developing the athletes general fitness qualities, and movement patterns. By the end of this first off-season, the athlete should move well, know how to perform basic lifts and other training protocols, and see at least some improvement in their strength, speed, vertical leap, lean muscle mass (if they've reached puberty), and decreased body fat (if they need it). Overall though, the primary goal is to teach them how to move and train properly...an increase in performance will definitely be seen, but we're not aiming to turn them into elite athletes the first year. The emphasis of the 2nd, 3rd, and 4th off-seasons will ultimately depend on what the athlete's individual needs are. A very skinny athlete who is at least a year past their peak height velocity (largest adolescent growth spurt), will likely need to focus on developing greater muscle mass. An athlete who genetically carries quite a bit of body fat will need to focus on losing weight, and learning how to eat to avoid putting on excess body fat. A genetic freak (naturally muscular, lean, powerful) may be best served just trying to 'not get hurt' through strict maintenance of movement patterns, and increasing their relative strength. Speaking of genetic freaks, it is often easy to assume that since they're already more athletic than 95% of their competition, that they don't need to dedicate much time to training off of their respective field of play. Yet if we look at recent examples of Adrian Peterson (NFL), Morgan Reilly (NHL), and I guarantee Derrick Rose (NBA) this spring...freak athletes who have torn their ACL, are forced to dedicate their lives to building their bodies back up through PROPER & SAFE training, and have returned to perform better than ever...even the freaks can get even better by properly preparing their bodies for elite competition. It is difficult to create a program looking four years into the future, as with many athletes it will be very difficult to predict what it is that they will need to work on. Past the first off-season of learning to train and general fitness, it is necessary to perform a needs analysis on each of your athletes. Do they need to put on muscle? Get stronger & more powerful? Do they need to lose body fat? Do they need to just 'not get hurt'? Maybe they are already injured and a bulk of your off-season must be spent going back to re-developing sound movement patterns and general fitness. In a perfect world they do not suffer injuries, and each off-season can be spent on putting another piece of the puzzle in place. However, as Cuzzolin mentions below, no matter what the athletes main needs are (save injury), the last 6 weeks of the program should be spent developing power that is transferable to the sport itself. Back in October, the Toronto Raptors were in Vancouver undergoing training camp to prepare for the upcoming NBA season. During some of their downtime, I had the pleasure of interviewing head strength & conditioning coach, Francesco Cuzzolin. Born and raised in Italy, Francesco has 20 years under his belt working with teams competing in basketball, volleyball, and rugby. The vast majority of his experience has been involved with basketball, as he has been the strength coach for the Italian, Russian, and Serbian national teams. He has also spent 15 years as the strength coach for the storied Benetton Treviso basketball franchise, winners of 7 Italian League championships, and 8 Italian Cup titles. The purpose of this article is not to simply re-write, verbatim, everything that we talked about, but to give an insight to how professional basketball players are trained. You will also be able to perceive physical and psychological coaching methods used to coach a professional basketball player, which can be crossed over to your coaching of the average Joe or weekend warrior. In this day and age, it has become easier to stress the importance of strength and conditioning to players because the young players see how hard the elite NBA players work. They realize that for their fine motor skills (shooting, ball handling etc) to show the greatest output, they must be able to express their peak athletic ability. Immediate results in the league depend, in part, on their athletic development coming in from college. Have they reached full athletic maturation yet? Have they been shown how to lift with pristine technique? Possibly of utmost importance, are they fit to train? Unfortunately for some players, they enter the league without the physical stature to compete against grown men over 82 games in 6 months. Even worse, some players enter the league without the prerequisite mobility, stability, and movement symmetry needed to even begin training for the hypertrophy and maximum strength which they require to contribute on the court, night in and night out. Enter the importance of showing the athlete results in ANYTHING. Whether you increase their mobility, or improve their stability, the athlete needs to have trust in you, that what you are coercing them into is beneficial to their career. Another notable way of keeping their attention is to educate them. Teach the athlete about their body, and the methods you are using to enhance it. It takes years to fully develop an athlete. This development process will be shorter or longer for different players, depending on their training status entering the league. Even if a head coach gives their input and asks for the athlete to increase their hops, gain bulk, and become stronger in a single off-season, it is the role of the strength coach to determine the weakest aspect of the athlete each off-season and strive to eliminate that weakness in the time from the season ending to the beginning of training camp. It is important to note, however, that six weeks prior to training camp, peak power is the objective of EVERY player. Once the young player has been deemed fit to train, they must first establish a work capacity. This will be accomplished by ensuring a solid aerobic base, and performing metabolic conditioning of the ATP-CP and anaerobic glycolytic systems. Whether the player is a string bean ectomorph or has mesomorphic attributes, the development of speed strength is always integrated into the program. Speed-strength is the amount of force which can be developed against little external resistance or zero external resistance. This requires explosively performing a lift with ~20% of the athlete’s 1-rep maximum. Compared to an NFL player, 99% of NBA players are considered skinny. This is due to the fact that excess bulk has little importance in basketball, rendering traditional mass building exercises, such as the bench press, useless in most circumstances. A center must push opposing centers and absorb upper body contact, making this, in most cases, the only position benefitting from the bench press at some point in their training. Speaking of absorbing impact, basketball players must be able to absorb impact either from contact by an opposing player or by deceleration of their own body weight. As fast as the athlete can absorb the impact, they must be able to accelerate by pushing off their opponent, performing a cut in the opposite direction, or going straight back up for the rebound or put-back basket. To be precise, acceleration and deceleration must be performed in ALL planes of motion AND unilaterally. Developing hypertrophy can be a hard task for a young NBA player. Success requires them to lift with enough volume and eat the required calories, while at the same time expending A LOT of energy on the court developing their fine motor skills (shooting, dribbling, etc.). A unique method to use in this scenario is to perform very slow repetitions (i.e 3-5 push-ups in 1-3 minutes) in order to develop the high eccentric tension needed for muscular hypertrophy. This method ensures hypertrophy, along with the development of fine motor skills, without depletion of precious calories and risk of overtraining. To note: This super slow method is used at the end of the hypertrophy workout which would include 3 sets of 10 repetitions for the main muscular group and another 3 sets for the antagonist group. Finding time for lifting sessions during the grind of the 6 month NBA season (8 if you make it to the NBA finals) can be hard to come by. This makes it essential that every weight room session take no longer than 45 minutes. Before, or after, practice or shoot around, players will hit the weights with the main goal of keeping joints free and ready to go. The high intensity, low volume sessions consist of circuits with five stations. 1) Legs 2) Push 3) Pull 4) Ankle health 5) Core. Have ever wondered why it takes your favourite player so long to return to his pre-injury level of production? Or maybe you ask yourself how a player who loafs around all summer can be put through a gruelling training camp and pre-season practice sessions, only to still gasp for wind once the season rolls around? This is because a player should optimally have at least six weeks to work on anaerobic conditioning prior to the start of the NBA season. It is not required of the player to begin the season at their genetic potential of conditioning. The goal is to peak in the 7th month of the season, just in time for the playoffs. For the player coming back from an injury mid-season, they need a minimum of one month of intense conditioning to have themselves fit enough to compete at a high level. It is not until the third week of a given mesocycle that a strength coach can have the athlete go all out. The first week is set aside for assessment, ensuring the athlete is fit to train. The second week is intended to ensure the athlete does not suffer any immediate setbacks from the training load. The strength coach will allow the athlete to go all out in the third and fourth weeks. Box Jumps – Why Do We Do Them? I find that the box jump is one of the more misunderstood exercises out there. In the past, I have myself questioned what their purpose is, and have heard multiple other coaches question them as well. Yet, I have stumbled across only one article from a well known coach on box jumps that was negatively biased, and was focused solely on how dangerous they are. There was no mention of the benefits of box jumps. This brief article is meant to shed some light onto why you would want to use box jumps, when they will be no different than squat jumps, as well as safety measures to protect you and your athletes from injury. · You need to develop reactive strength in your athletes. Reactive strength is a form of explosive strength, and refers to the ability to get off the ground as fast as possible once making contact with it. This means that the exercise is performed as a plyometric, with only the balls of the feet making contact with the floor, aiming to get back off the ground as fast as possible. Please see this article on explosive training to learn the various derivatives of explosive strength. How is the Single Effort Box Jump Different than a Squat Jump? One question posed recently by my friend and fellow strength coach, Dan Adams, and one that myself, and I am positive many others have, is why not just use squat jumps with healthy athletes? Dan and I discussed this in depth, and determined there are multiple variables that must be considered to differentiate the two. If we are talking about single effort box jumps, we must consider many variables, one of which is Center of Mass. When you perform a squat jump, and when you land in an athletic ready position on top of a box during a box jump, your center of mass is actually the same as if you were performing a squat jump. 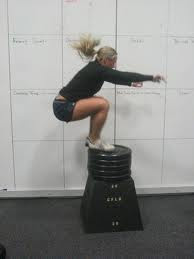 Therefore, unless you are going to stand up on top of the box, and then step off and land, the force your body must absorb upon landing is the same no matter if you are performing a basic squat jump, or if you are jumping up onto a box and lightly frog hopping off the box to get back to the ground. Thus, if you are looking for greater ground impact to develop the athletes’ ability to decelerate, make sure they stand up on top of the box prior to jumping back to the ground. A single effort box jump is a great exercise for those who are rehabbing, or are monitoring fatigue levels, and should not be exposing themselves to a high degree of ground impact. However in the case of the injured or over-trained/over-reached athlete, you should have your athlete jump onto the box, and use a chair or other device to step down safely to the floor. 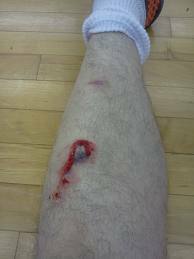 Box jumps are fun and challenging! It is easier for an athlete to give full effort when they have no choice but to get on top of the box, or miss it and topple over the boxes or scrape their shins (see safety measures below!). Starting a competition amongst a particular group of athletes can also be a good bonding experience, as well as generate excitement and passion for training. How is the Continuous Box Jump similar to a Tuck Jump? To realize the similarities between a continuous box jump and a tuck jump (both performed as a plyometric), it is only necessary to remember the Center of Mass variable. In the continuous box jump, the athlete jumps up onto a box, very quickly jumps back down on the same side, and makes contact with the ground with the intention to explode back up off the ground as fast as possible. In the tuck jump, the athlete explodes off the ground, tucks their knees a high as possible to their chest, and then explosively drives their feet into the ground upon landing in order to get off the ground as fast as possible. In both exercises, the center of mass stays the same; therefore eliminating any extra benefit from ground impact forces you may believe you are increasing/decreasing by adding/eliminating the box. In order to increase the ground reaction force upon ground impact, you will have to, again, first stand up on the box prior to stepping off, or begin a depth jump from a greater height. It is very common to see pictures posted on social media of those who have attempted and failed a box jump. In order to save the skin on your shins when failing an attempt on a wooden box, or avoid painfully collapsing on the floor, it is necessary to seriously consider some safety precautions. · Have a spotter behind the athlete, in front on the other side of the box, and on both the right and left of the athlete. This creates a safer environment, and also helps mentally prepare the athlete to jump to a high box. · If you are using aerobic steppers, or multiple smaller boxes as your platform, ensure that the spotters are holding the box steady as you start getting to the greater heights. · If you are monitoring fatigue, or are dealing with a rehabbing athlete, have them step down safely off the box. · Unless you are attempting a personal record box jump, make sure the athlete lands in an athletic ready position with a neutral spine. I am pleased to announce a partnership with professional triathlete Andrew Powell. 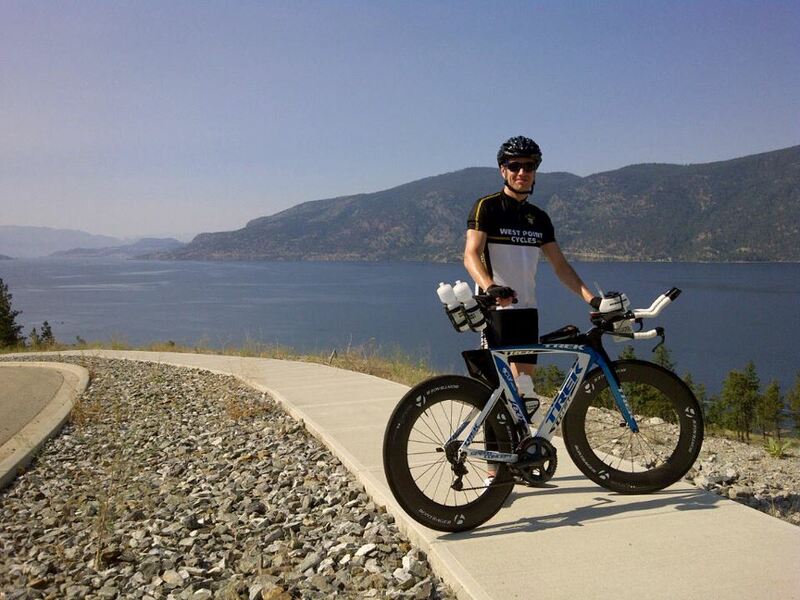 Andrew has been competing in triathlons since 2008, and has since completed 30 triathlons, including 9 Half Irons, and 2 Ironman races. His first professional category race was at Ironman Arizona in 2011, with his most recent accomplishment being a 2nd place finish at the Surrey international half marathon. His long term goal is to compete at the highest level of the Ironman pro field, and to become an Ironman champion. I aim to help Andrew achieve his goals by providing him with the tools to become injury proof, and improve his strength to achieve an increase in his movement efficiency and speed. There is a common trend taking place in training for all sports, with players and coaches often feeling the need to have the performance training they do in the weight room closely mimic specific sport movements. Often times it may feel necessary to make an exercise excessively sport specific in order to achieve carryover to the sport itself. However, a stronger focus on a concept known as ‘General Physical Preparation’ (GPP), will help prevent premature overspecialization, and quick increases in performance followed by stagnation. GPP involves increasing all of your fitness qualities which may be applied to wide variety of sports. This includes strength, power, endurance, flexibility/mobility, and overall motor coordination. It also involves ensuring each individual athletes’ movement dysfunctions and weaknesses are narrowed in on. This article strives to discuss the importance of developing a well-rounded athlete before focusing on developing the basketball player. The first step in developing a well-rounded athlete starts with the variety of skills and abilities that are best learned in an actual sport environment. A common point of debate amongst parents, coaches, and players revolves around whether or not players should specialize in one sport from an early age if they want play at a high post-secondary level, or even make it pro. In their youth, basketball players should be learning and playing other sports, and working to develop all of their fitness qualities while training. If a young basketball player develops a larger base of athletic abilities from other sports, they will master basketball specific skills to a higher degree. Ask Steve Nash if soccer helped him in the long run with his footwork, endurance, and creativity. Ask Chase Budinger if his strong background in volleyball helped develop his power and vertical leap while on the basketball court. I understand that once a player falls in love with basketball, all they want to do is stay on the court, and that they believe any time not spent practicing basketball will put them far behind their peers. I also understand that it may be hard to convince some players to buy into this – but I think all athletes should dabble in traditional Olympic sports such as gymnastics, martial arts/wrestling, or various track & field events during childhood and adolescence to give them a very well-rounded foundation of athletic abilities such as strength, power, endurance, and movement patterns on which to build a high level of athleticism. In the weight room specifically, youth basketball players should be performing full body movements, without worrying about 'sport specificity'. For example, all athletes should squat, but don’t squat only a quarter of the way down just because that is about as much as you’ll load your hips in most game situations. Not only will a partial range of motion neglect many large muscle groups that are responsible for jumping higher, and accelerating faster, it will also hinder the maintenance or development of the fundamental human movement patterns that will keep you healthy over your entire playing career, and in life. Furthermore, you must give your body a buffer zone of mobility, stability, and strength for the moments that you DO find yourself squatting deep in a game, such as during many post-up, box out, or defensive situations. As another example, don’t perform countless overhead tricep extensions in order to mimic a jump shot. This is an isolation movement that works one joint, and will, over time, lead to elbow injuries. It is also not a great use of your time when you may only have a few hours a week to lift weights. A better option would be a bigger 'bang for your buck' exercise such as a dumbbell chest press, which will strengthen many muscle groups (including the triceps) at once, requires full body coordination if done properly, and will allow you to spend less time in the weight room. The vast majority of your off-court training should not be too sport specific. If you think about it – all the actions you are performing on the court in games, practices, and scrimmages are already very sport specific, therefore it is necessary to use the majority of the performance work you do off the court to balance your body. This balance will keep you healthy and allow you to reach your full genetic potential. However, if you have maintained a very solid base of general physical preparation, and as you get closer to the playing season, or are entering a high level of collegiate or professional competition, then you can start gearing your conditioning, strength exercises, and speed/power development a little closer to the demands that you would see on a basketball court. All basketball players, and athletes in general, should learn how to properly squat, hip hinge, lunge, push, pull, rotate, jump, and land. All of these movements appear in the game of basketball in one form or another. Become proficient and strong with these movements, and they will become easier and less energy consuming in a live game scenario. If you have a high-octane game like Dwayne Wade, you may also need to learn gymnastic tumbling skills when you get bumped down on your way to the basket! Play different sports in childhood and adolescence! Games, Practices, and Scrimmages are already sport specific. Use your time off the court to balance your body to stay healthy, and reach your genetic potential. Please feel free to e-mail me at Sean@NorthPoleHoops.com if you have any questions about how you may integrate these ideas into your child or athletes training program. Arroyave, Luis (2006). “NBA’s Kobe Bryant almost became a soccer player”.Chicago Tribune. The following is an excerpt from a paper I wrote during my time as a Master's student at the University of British Columbia (The State of the Strength and Conditioning Industry in North America). This section take a brief look at the importance of training your fundamental movement patterns, and staying away from "sport specific" training. Development and/or maintenance of fundamental human movement patterns has become the centre of attention amongst the top professionals in the strength & conditioning and rehabilitation industries today. Efficient movement patterns will increase an athletes’ performance by making them more proficient with their skills and less prone to injury in their respective sport, while creating the opportunity to be stronger and injury free while training (Cook, 2010). Many athletes and coaches alike have the perception that ‘if we simply exercise, we will automatically move better’ (Cook, 2010, p.52). Due to this belief, many coaches subscribe to the idea of more is better. Athletes will be subjected to an outlandish volume of work, without enough attention paid to the qualities of strength, and movement. If an athletes’ training regime consists of high volumes of work all the time, then they will not be exposed to the sufficient intensities required to increase their absolute strength. Absolute strength may be defined as the maximum amount of force one can apply in a given effort. Strength is the basis for all other performance qualities such as power and endurance (Siff, 2004). Strength also plays an integral role in developing proper movement patterns. Once proper mobility has been developed within the athlete, stability must be developed by sequentially becoming stronger (Cook, 2010). Often times when an athlete is subjected to a high volume of exercise, they will compromise movement quality to gain movement quantity. While repetitive movements are completely necessary to groove a movement pattern into an athletes’ neuromuscular system, discretion must be taken on behalf of the coach and athlete to stop exercising once proper technique has broken down (Cook, 2010). As previously mentioned, one of the most important points to consider as a strength coach is that anyone can create a difficult exercise or program, but only the great strength coaches can design challenges appropriate to any athletes needs and abilities. Another problem, which often runs concurrently with a disregard for movement patterns, is the trend of using exercises which attempt to very closely mimic the sport played. It is important to note that sport specific exercises do in fact play a key role in a successful sporting career. The issue is when sport specific exercises are used prior to mastering traits of general fitness and athleticism. General physical preparation (GPP) is intended to provide balanced physical conditioning in endurance, strength, speed, flexibility, and movement patterns (Siff, 2004). This is comparison to specialized physical preparation (SPP) which concentrates on exercises which are more specific to the particular sport. Problems arise, for example, when parents ask strength & conditioning professionals for pitching specific drills for their young baseball player; however, this young baseball player does not yet possess the strength to simply perform a pull-up or push-up (Cook, 2010). Athletes must use a progressive mentality to training, just as a baby must crawl prior to walking, and walking prior to running. GPP should be the early focus of an athletes’ out of sport training, with their training becoming progressively more specific as they have reached full maturation, have decided to focus solely on one sport, and once they have established sufficient proficiency in the qualities of focus within GPP. Exercises that closely mimic ones sport should be used as a ‘trump card’ of sorts once they are no longer making substantial improvements in the qualities of GPP (John & Tsatsouline, 2011).